Since the start of the European Semester in 2011, the EU member states have made progress in financial services, in fiscal policy and governance. 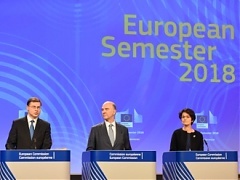 The Semester has been enriched in 2018 by requirements of the European Pillar of Social Rights. Besides, the states are having good guidance in getting support for progressive structural reforms. Provisional data of the Central Statistical Bureau (CSB) show that in January 2018 the foreign trade turnover of Latvia amounted to EUR 2.05 bln, which at current prices was 12.4% more than in January 2017, of which the exports value of goods was 18.1% and imports value of goods was 7.9% higher. In January, Latvia exported goods in the amount of EUR 959.0 mill. but imported – in the amount of EUR 1.09 bln. According to Statistics Estonia, in January, compared to January 2017, the exports of goods increased by 9% and imports decreased by 8%. The growth in exports was broad based, increase occurred in most commodity sections. After decline of the Lithuanian beer market by nearly 10% last year, tendencies for breweries remain unfortunate, with the market expected to narrow by further 7% in 2018, says Svyturys-Utenos Alus, the leader of the Lithuanian beer market operated by Carlsberg production group, informs LETA/BNS. Speaker of the Estonian parliament Eiki Nestor will join a statement against Russia's Nord Stream 2 gas pipeline, which was signed by the parliamentary speakers of Lithuania, Latvia and Poland in Vilnius on Sunday, reports LETA/BNS. U.S. company Bell & Howell is to start providing U.S. retailers with smart locker technology Cleverflex, produced by Estonian delivery solutions company Cleveron, informs LETA/BNS. The Nord Stream gas pipeline projected on the bottom of the Baltic Sea is an instrument of Russia's state policies, which will make Europe more dependent on Russia, say parliamentary speakers of Lithuania, Latvia and Poland, reports LETA/BNS.